Twice a week I work out with free weights - doing a combination of circuits for about 30 minutes. Whenever I do this when the kids are around, they always beg to try using weights too, but I never let them, for fear that someone will drop a 10 pound free weight on a foot and get hurt. 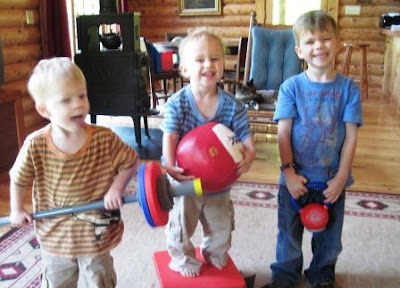 Recently, though, we got the opportunity to review WOD fitness equipment for toddlers and children, and my boys finally got to try out some weights. When I opened the four boxes of items we received from WOD, it was like a mini gym right in our living room. I could practically smell the testosterone. Pretty sure this is how things will be all the time in about 12 years. The barbell weighs 2.2 pounds. So you don't have to worry about your child straining something in lifting it. The boys also loved stepping up on the Plyo box and jumping off. The Plyo box has a weight limit of 60 pounds, but it's very sturdy. My kids are so skinny they will be able to use it for years. 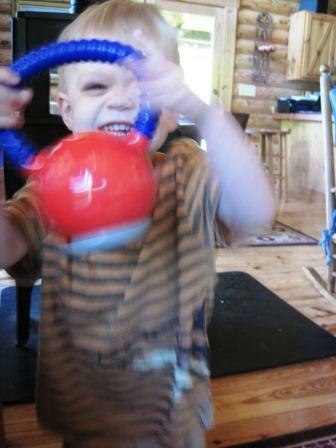 The kettle bell was a fun addition to their workout routine. I was just a little jealous. After all, I don't even have a kettle bell! Now I think I need to get one so I can be like my boys! By far, the biggest hit was the medicine ball. At just 1 pound, you don't have to worry about them throwing it at the wall - or each other. Cort and I played with the medicine ball all afternoon - he was particularly taken with it. We rolled it back and forth, and worked on his catching skills. Pierce worked on his catching skills too - he's not the most coordinated when it comes to this sort of thing. Cort demos practicing on the Plyo box. 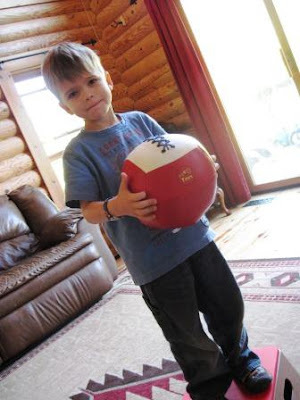 Excellent for kids still working on their up and down steps skills. Reid did a routine he made up himself, where he hooked the kettle bell over his feet and then pulled it in towards his belly. A sort of kettle bell crunch. Happy boys, finishing up their extended workout. We loved these products! They were durable, fun, and physical. 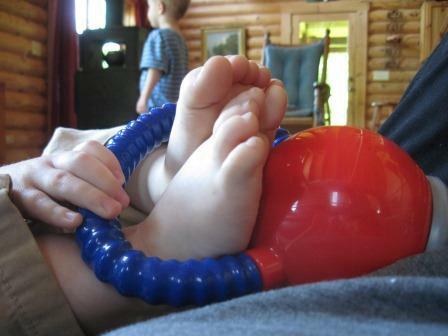 I want to add that these would be an excellent addition for the child that has sensory issues or gross motor imbalances. 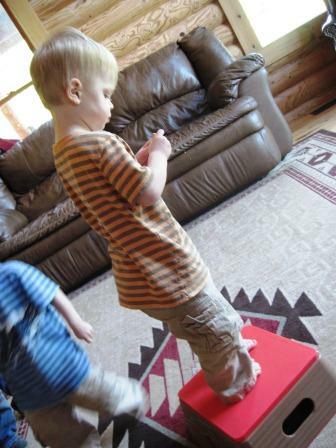 They are a fun way for the child to work on weak areas and strengthen them. These items were just released, but I wouldn't be surprised at all to see occupational therapists using them in the future with young children. WOD also has soft versions of these items for babies! 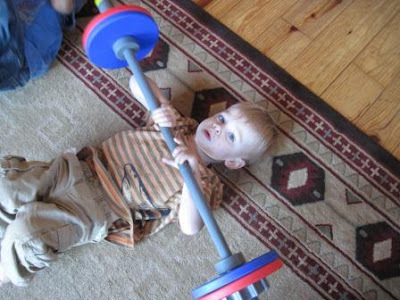 Yup, your infant can even get in a workout safely! You can find WOD on Facebook and Twitter too. Also, if you would like to order some of their products, enter the code twobears2012 for a discount coupon! Disclaimer: I received four products from WOD for review. The opinions stated above are my own. Wow, this is the coolest thing I've seen for kids in a long time. One of those "Why didn't we think of that?" concept. 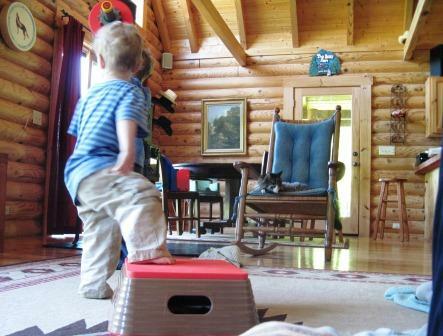 Looks like fun and a great way to burn off some toddler energy. Looks like your boys absolutely loved these! Very cute photos and a great way for them to work out! This looks like so much fun. With all the couch potato kids today, this would be an excellent way to get them up and moving with fun and innovative tools. Love Reid's inventive new exercise! Wow! What wonderful items! I bet the boys play with them all the time. My children are all grown up now. But. I was thinking what a terrific way for the kids to release some of their energy on cold winter days when they cannot get outside. Very cool that you had three little helpers who very much enjoyed using all this fitness equipment. What a cool idea to make it pint sized for the little ones. How cute! Looks like so much fun! What a great product! I wish they'd been around when my kids were that age. What an excellent idea and product! I'm so happy for the boys that they can workout with Mommy now! What fun! 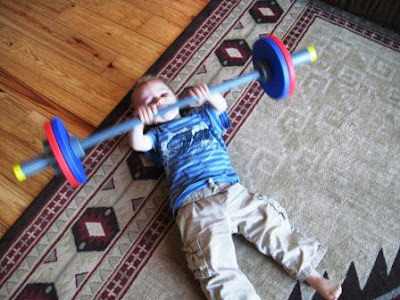 Great exercise equipment for kids.. Kids these days don't get enough exercise --so this would be GREAT for them. another moment when I am SAD that my kids are too old. What a smart idea-products like this that make fitness fun. Amy would have loved these so much. Your boys are so cute working out, too! NO WAY! OMG My hubby is going to flip when he sees this, we always joke about kids workout equipment. This is awesome. I love it!!! How fun is that! These are so cool. Now the kids can workout beside mom and dad! And start good habits early. I LOVE the last picture, it is just full of joy and wonderful!!!! So cool! I bet the boys were so excited about these! That stuff looks great and perfect cor our household. Those picturesbare simply priceless. That's a great way to get kids to start exercising early! Way to go, mom! 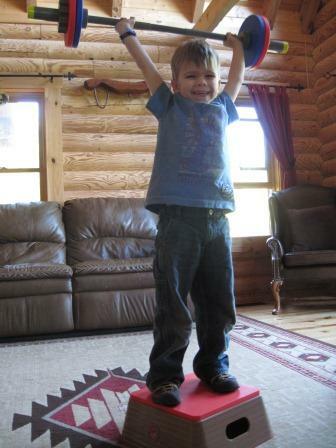 How cool that kids can do their own workout! What a great idea. What a fun product! I love the weights over his head- he looks so proud! So that is the inside of your house? I am so jealous. That is my dream house. Beautiful! THey are so sweet! I love them. what a great idea!! your boys are too cute for words!! The boys look like they enjoyed these products. Actually, I think they are great to get young children involved in fitness. And it was fun for everyone - right? What a great product to start young ones on a lifetime of physical fitness. Looks like alot of fun -- for both boys and girls! omg! I love these! :) How cool! These are awesome!!! What a great way to get kids to be active. Now that is so cool. I might have to look into that.